Identification: Large ruminants looking very much like cattle. They are heavily built & bulls are black, cows have reddish brown tint with the black. Bulls have heavy horns with well developed "Boss". Cows horns are much lighter, they have broad muscle and large ears situated behind the eyes. Size: Mass 750-800kg. Shoulder height - 140cm. Habits: Move around in large family units of up to 3000 in a group. Old bulls group together in bachelor groups, in the dryer season they tend to graze near water. Non-selective grazers, also browse a bit. 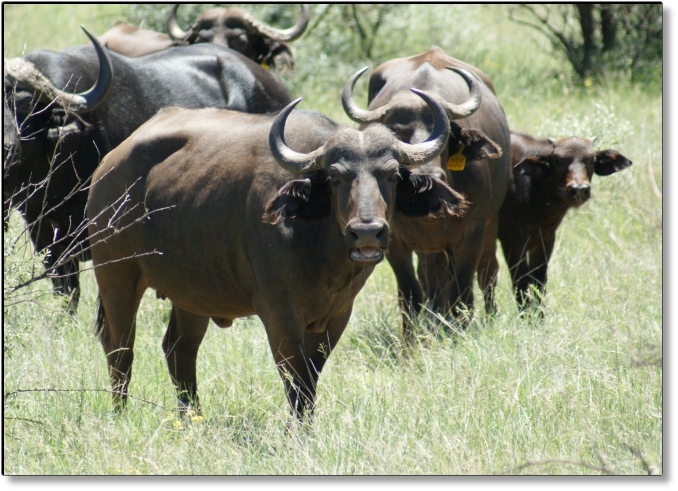 Buffalo are carriers of foot, mouth & corridor disease. Puberty at three years. Gestation 330-346 days +/- 11 months. Birth weight - 40kg. High mortality amongst calves. Distribution: Central & Southern Africa. Buffalo is a sought after species and highly intelligent animals. They are very popular among trophy hunters and offer a challenging and dangerous hunt. They have a calving interval of 13 months and they offer a good return on investment. They are very easy to farm with and will do well in most areas where cattle farming is done. They are non-selective grazers.